In 1995, Margaret Sheppard conducted a large number of interviews with residents of Hemyock, about their eyewitness memories of life. Kindle books resulting from these interviews are published in the "Hemyock Memories" series. 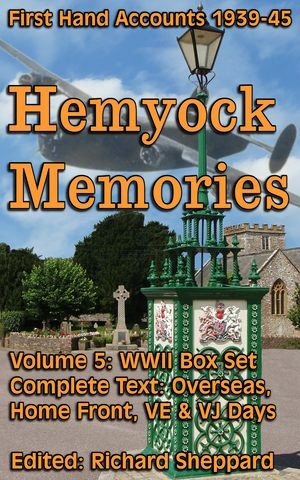 The complete WWII "Box Set," Hemyock Memories Volume 5, contains all our WWII volumes 0, 1, 2, 3, 4 covering life during World War II 1939-45. These Memories of WWII Kindle books contain over 75 first-hand accounts by residents of Hemyock, of their life during WWII, both serving overseas and on the "Home Front." HD Slideshows of the many photos are on YouTube and also available on DVD. This is the first volume in a series containing fascinating tales of long-forgotten rural life in Hemyock and the Blackdown Hills. This series is based largely on personal interviews conducted in 1995; edited & republished in electronic format on Kindle, to raise funds for Hemyock&apos;s Blackdown Support Group Charity, which does so much to help frail & elderly residents. These series of Kindle eBooks can be read on any Kindle device, and also in the free Kindle reading apps that Amazon offers for PCs, tablets and smartphones. Kindle now also offers a free online Kindle reader, which works within most web browsers. 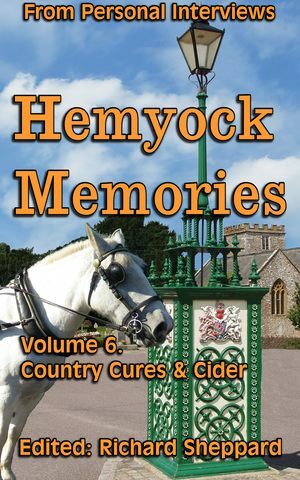 It includes the story of healing the eye of a valuable Arab colt horse, using just ordinary sugar; Also cider-making at Hemyock Castle Farm. This book relates some traditional remedies for humans and horses; as well as the important part that cider and cider-making played in village life. It is equivalent to about 20 A5 pages. Originally, the memories were published in 1995 as Hemyock&apos;s Memories of War, a 65 page, A4 printed booklet, illustrated with many photographs. Several hundred copies were sold. All profits went to the Royal British Legion. The adapted extracts published on this website in 2005, to commemorate the 60th anniversary of D-Day, give a flavour of these rare stories from a wide variety of eyewitnesses. Wartime Life; Homeguard; Farming; Aircraft; Evacuees; Memories; Village Carpenter goes to War. Now edited & republished in electronic format on Kindle , to raise funds for Hemyock&apos;s Blackdown Support Group Charity, which does so much to help frail & elderly residents. Volume 5 contains all 5 previous volumes; making it a complete WWII Box Set. Links to Video Slideshows of Original WWII Photos. Links to Videos of WWII Excerpts. Several edited excerpts of the WWII Memories are available on YouTube. These use automated text-to-speech software to read the text aloud, while the text scrolls slowly up the screen.